The first time I attempted to write this article I started to write about the different types of cante and get very technical. But the truth is that cante is not my speciality and there are many other resources that write about it much better than I ever could. At the end of this article I'll give you a list of some good resources if you'd like to do some more detailed reading. 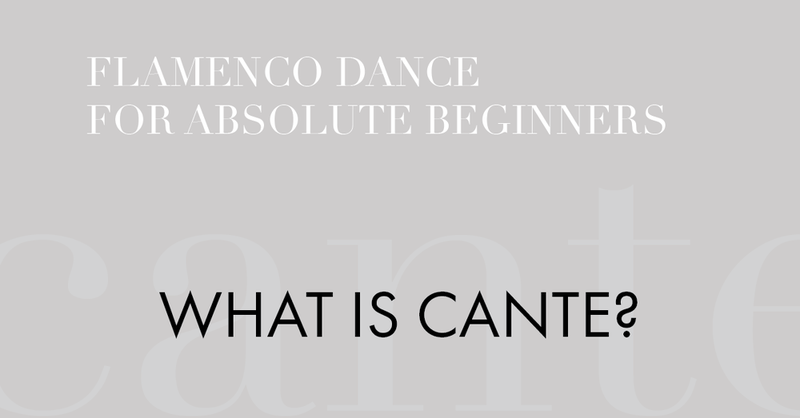 I am still learning about cante every day and I think about it in terms of how it makes me feel when I dance and how the structure influences how I dance. The image to the right the 'Genealogical tree of cante' shows you just how complicated and vast cante flamenco is. The best way to study cante, instead of trying to understand the technicalities of it, is to listen to it. By that we don't mean have it on in the background while you are washing the dishes (although that isn't discouraged), you need to pick a song and listen to it with open ears and see what you can notice. Lets take a look at tangos for example. Here we have Yolanda Heredia dancing por tangos. If you click play the video will start just before a verse of tangos is sung. You will see Yolanda performing a llamada (more on that later) to bring in the singer. The verse is very traditional. This verse can be sung (or interpreted by the singer) many different ways. In the video the singer chooses to take a breath after singing 'Triana triana' as the first line of song. In this space the dancer performs a remate (again more on that later) and then the singer continues after the remate is completed. The singer could also have chosen to sing 'Triana triana que bonito esta triana' before taking a breath. This is completely up to their discretion. The dancer, not necessarily knowing what the singer may do needs to be listening so that they may respond. Then the verse proper starts and the dancer follows the singer until the end of the verse when she once again closes the cante with a remate. During the verse the dancer performs steps that mark the shape of the tangos rhythm and interprets the verse that the singer is singing. One thing you should also pay attention to is how the cante sits with the compás. In this case the lines of song pretty much match up with the compás although the singer in this video plays with the timing of the first line of song with the remate in the middle. With other styles of cante it is not as clear. One more thing to note before we get to the resources. Not all cante flamenco can be danced. For example there is only one type of fandango that may be danced - the fandango de huelva, but there are many many more types of fandango that are only sung.